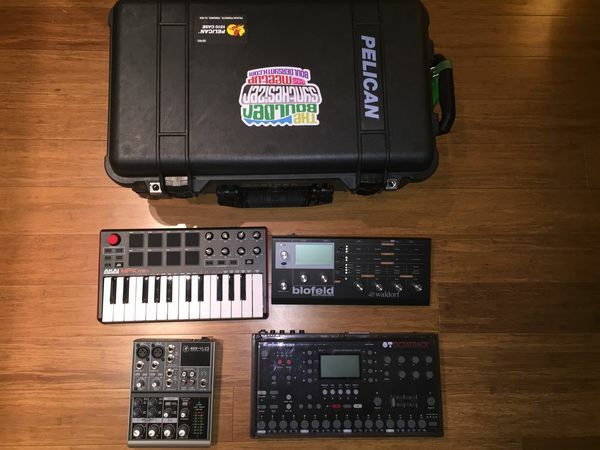 This is a follow-up to post "Flight-Friendly Hardware Synth Rig Part 1 – Switching to Hardware Rig for my Solo Set". Over the last 5 years or so I've had the opportunity to fly to festivals. It's always a challenge of course to get your gear from here to there. One strategy I'd recommend is to back into your show rig from what will fit into the luggage you are going to travel with. 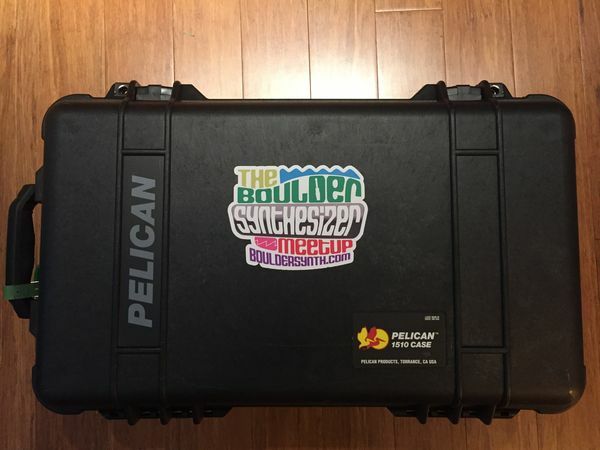 Something to consider here is that you want to bring enough essential gear as carry-on so that you could perform your set even if your checked luggage doesn't make it with you to the venue. So a backpack and a case that will fit in the overhead bin are the way to go. It's important to get a tough case for the overhead bin in case you are asked to gate check the bag or end up on a regional jet where approved sizes won't fit. This has happened to me multiple times over the years. In this scenario they'll put the bag right into the cargo hold so you at least know your gear will make it to the destination with you. My friend and amazing artist Dino J.A. Deanne (http://jadeane.com/blog) who's done many tours turned me on to the Pelican 1510 Carry On Case. 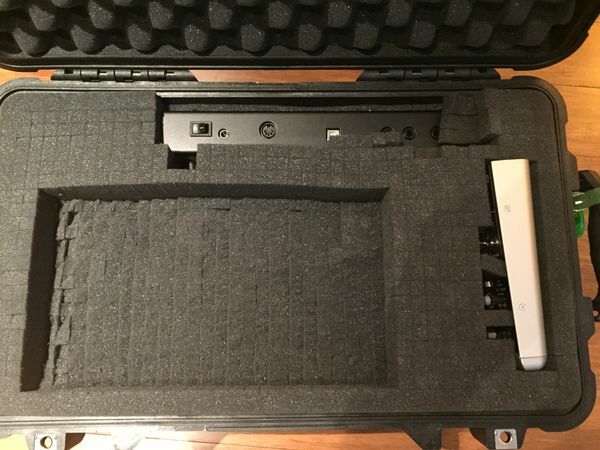 Here is Dino's post on cases. Meets the FAA MAXIMUM CARRY ON SIZE! This case is just amazing. I ordered the version with the Pick N Pluck foam so I could customize the case for my desktop rig. The biggest challenge is deciding how you'll lay out your gear to fit. 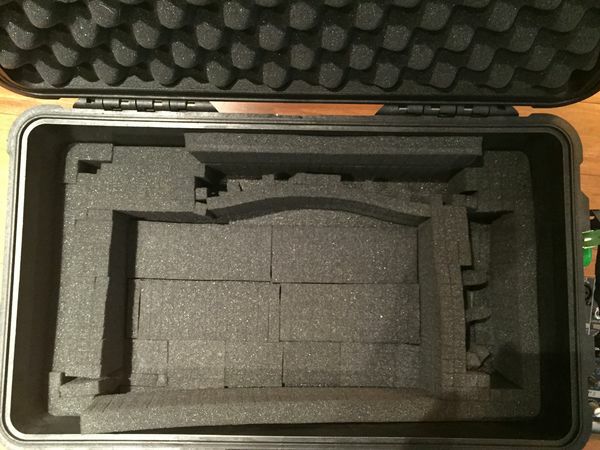 Here is my case from the inside out. Pick N Pluck comes in two sheets that lay on top of each other. Place your gear on the sheets and use chalk or toothpicks to mark where you'll need to punch out the foam to fit your gear. Then just pull the little rectangles off. The picture above shows the bottom layer punched out to fit the Octatrack, Blofeld Desktop, and Mackie Mixer. Hang on to all those scraps as they com in handy. For example, I used Elmers Multi-Purpose Spray Adhesive to glue Pick N Place scraps to create one more layer of padding on the bottom of the case for the Octatrack. I also sprayed adhesive on q-tips and used it to glue the thin run of foam along the top and for other miscellaneous padding. In this next photo, you can see I've placed the Octatrack and Blfoeld Desktop into the case. Note that there are slots cut out for the blofeld knobs. It looks a little precarious at this point but adding the next layer tightens things up. 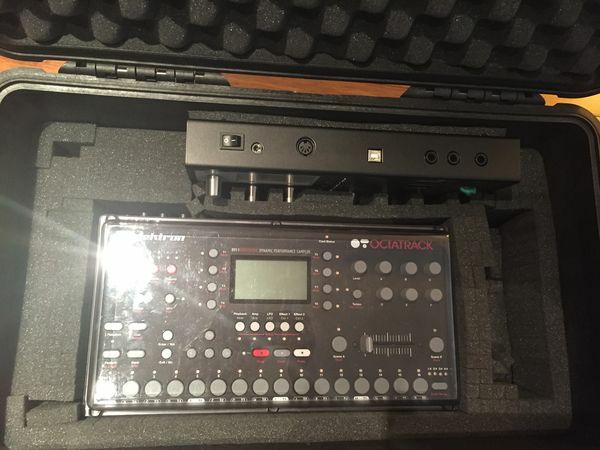 Also note that I have Elektron's Protective Lid PL-2 on top of the Octatrack. The lid is expensive at $59, but I consider it a MUST BUY for Elektron users who take their instruments out of the studio. 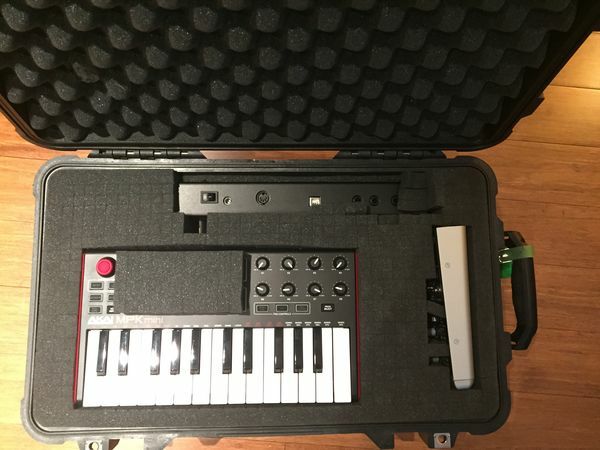 I'm also a fan of the Elektron ECC-2 soft-sided carry case (which includes the lid) if you just want a way to carry your Elektron unit around by itself locally. In this next photo, you'll see I dropped in the next layer of Pick N Pluck foam and this time I glued some extra scraps to put tension on the top of the blofeld where there are no knobs or LEDs which also ensures that there is not pressure on the knobs. I also inserted the Mackie 402VLZ3. 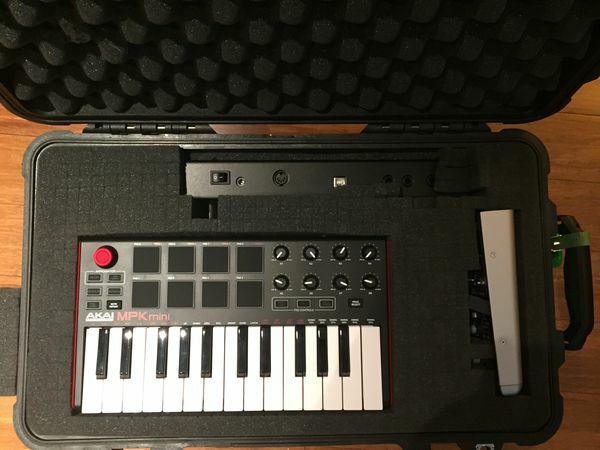 I then carved down into the foam so I could add an Akai Professional MPK Mini Mk2 to the rig. I used some scraps to put a layer over the drum pads so the lid wouldn't crush the joystick. When you button the case up, nothing moves at all! If you really mess things up and need to start over, or you want a different configuration of padding for a different rig, you can buy replacement foam on Amazon. There of course an incredible number of choices for backpacks. Ultimately, you just need something you dig that will fit all your gear and still fit under the seat in front of you. 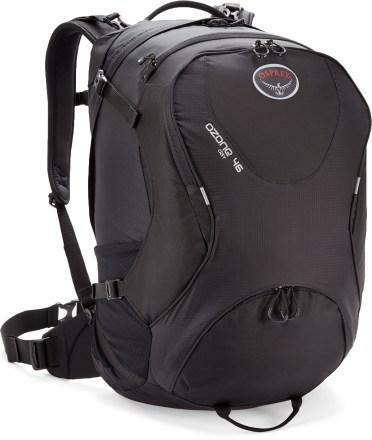 I used to use a North Face Surge and last year switched to a consumer backpack – the Osprey Ozone 46. While there are many fine choices in DJ backpacks, I prefer the consumer backpacks so I can use them for things other than toting musical gear. In other words, they are lighter when you are doing other things but it's up to you to add padding to fit most musical journeys. Carry the essentials to pull off a show in this bag – plus items to keep you going during the travel day. Any recorders you need to document the show like a GoPro, Zoom H2N. Nalgene OTF Water Bottle with locking lid. You can open and close it with one hand. Even if you kick it over on stage you won't soak your cables or rig. Fill it up on the other side of security for the odd chance that you get stuck on a tarmac somewhere.